Even though cats are domesticated today, they were once wild, feral animals. Your adorable little kitten and every other domestic kitten is a direct descendant of an African wildcat. The African wild cat was first domesticated in ancient Mesopotamia and Palestine around 6 centuries BC when people realized how valuable a cat was for hunting small rodents and preserving their crops. During that time, the only source of fresh and clean water were springs and free-flowing bodies of water. 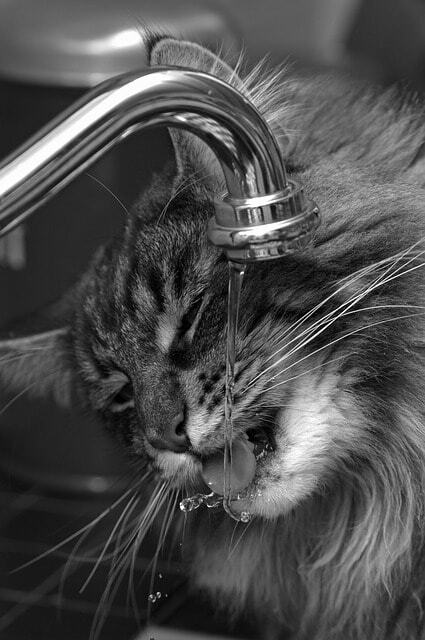 Ancient cats drank that water because standing water was frequently ridden with bacteria. Our domesticated cats today get their water directly from the tap into their bowl, and that water stays fresh for a limited amount of time. Especially if your cat’s water bowl is located near the food. 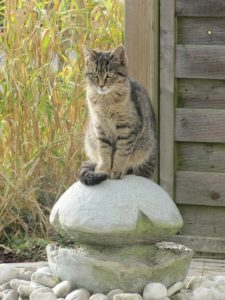 Today we will talk about the benefits of buying your cat a pet fountain and why you should do it. If you have noticed that your cat is not drinking enough water during the day, keep on reading to find out why and how to encourage your kitten to drink more. Drinking enough water during the day is important for almost every living creature. Especially mammals. Your cat’s body is made out of 70% water, much like you and I, and that means that she needs to get enough water into her system on a regular basis. Even though cats get their water mostly from their food, we tend to feed our cats dry cat food which doesn’t contain any fluids required for hydration. You would be surprised how many cats are in constant state of dehydration because of their diet. All of that can lead to serious health issues such as problems with kidneys and urinary crystals. Since ancient cats were accustomed to drinking flowing water because it was fresh, a huge number of domestic cats share that trait with their ancestors. You probably noticed that your cat likes to drink water right after you refill the bowl, or maybe your kitten likes to jump on the sink and watch the flowing water. That’s because they know that water is fresh. If your kitten behaves that way, you should consider buying her a pet fountain. Now that you know a little bit more about the history and reasons why cats prefer running water over that in their bowl let’s talk about the signs that indicate that your kitten needs a pet fountain. Does your kitten like to play with water? When you lower her bowl, does she take a huge interest in the moving water? When you turn on your sink is she there to watch the water flowing from up close? When you take a shower, does she investigate the bathroom after? All of that means that she likes flowing or moving water. Because of that, she might not find standing water in her bowl amusing, and she probably won’t drink it as much as she should. There’s a simple test you can do. Try putting an ice cube in your kitten’s bowl and watch what happens. Cracking noise and shifting water will probably get her attention and she will drink it because cold water means fresh water. If that’s the case with your kitten, she would be blown away with her own personal pet fountain. Dehydration can lead to serious health problems. If your kitten is healthy and eating regularly, but her water bowl stays full, she might need a little encouraging. As we have already said, your kitten might not find water in a bowl ‘drinkable,’ especially if it’s not fresh. Water in the bowl can easily get full of dust, hair, and chunks of food and that can be quite unappealing for your cat. This means that you probably need to change the water in her bowl a few times during the day just to get her to drink. With a pet fountain, your cat will have constant access to fresh, running water which is guaranteed to get her interested in drinking. Now comes the most important part, a part where we talk about the health of your little kitten. There is nothing more important than health. Since dehydration poses the biggest threat, you should check if your kitten is well hydrated. The best way to do that is to check the level of skin elasticity. Grab the skin around her neck and gently pull it. If your kitten is hydrated, skin will pull back easily and settle. However, if your cat is dehydrated, skin will lose its elasticity, and it will stay in a stiff position for a couple of seconds, and after that, it will slowly restore itself in the natural position. In addition to that, dehydration can also lead to urinary tract diseases. If your kitten is picky when it comes to her water bowl, then you will probably change her water a few times a day to make her drink it. However, with a pet fountain, you won’t have to do that anymore. Not only will it encourage your cat to drink more but it also can hold much more water than a regular bowl, and it will keep the water fresh for a longer time. Oh, and you won’t have to think about refilling a pet fountain as often as a bowl. So now that you know the importance of keeping your kitten hydrated, there is not much more to say. If your kitten doesn’t drink enough water, you should consider getting her a pet fountain. Not only will it encourage her to drink water, but it will also keep her hydrated and healthy and what more could you ask for? Now the only thing you need to do is to find out which pet fountain would suit your kitten. I hope this has helped you to consider looking for the best water fountain for your feline friend.